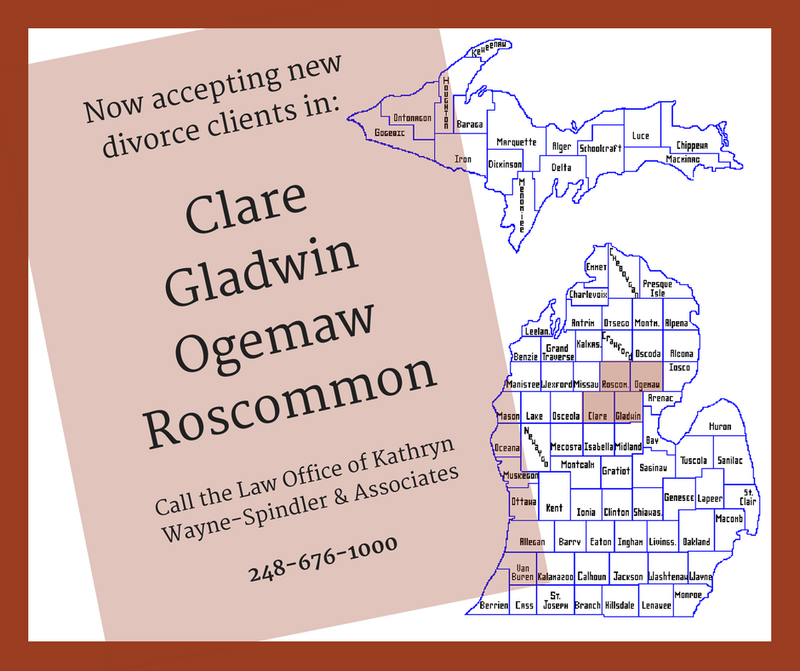 Kathryn Wayne-Spindler now representing new Divorce clients in four Mid-Michigan counties Mid-Michigan Divorce Lawyer has more than two decades of Michigan divorce experience Experienced Michigan Divorce Lawyer Kathryn Wayne-Spindler has added new counties to her practice area. She is now accepting new divorce clients in Clare, Gladwin, Ogemaw and Roscommon counties. She has been successfully practicing family law in Southeastern Michigan for more than 20 years. For representation in a new divorce matter, contact the law office of Kathryn Wayne-Spindler & Associates at 248-676-1000.